Part of the recent British invasion into North America, singer-songwriter Ed Sheeran is at the top of his game… but only because he isn’t playing one. Ed Sheeran’s song, “You Need Me, I Don’t Need You,” spouts the lyric, “See, I’m true, my songs are where my heart is.” But for Ed, it’s not just a lyric; it’s the truth. While he has consciously made an effort to live in the present moment and enjoy every step of his story to success, the minute he walks on set of our shoot, you can tell he’s not too sure about this new role as cover material. 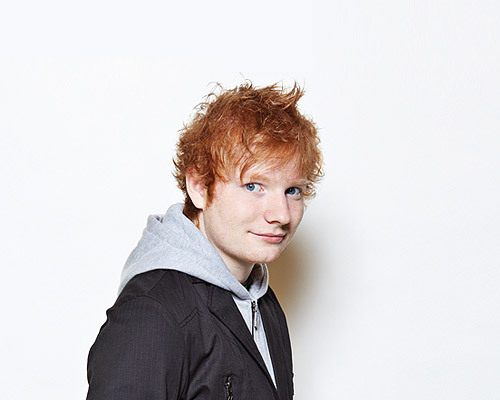 “I didn’t really think about it too much in the photo shoot because there weren’t very many photos being taken, which was good,” Ed says to me afterward. “There’s kind of a smoke screen in front of me, which is the music, but I think if you took that away I wouldn’t be an Armani underwear model tomorrow. If I was, they wouldn’t sell too many pairs of underwear,” he jokes. 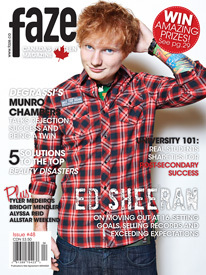 But the decision to put him on the cover didn’t come after admiring his vibrant red hair or gorgeous baby blues; our team was unanimous about having Ed Sheeran on the cover because his music—a unique combination of acoustic pop-rock with the occasional beatbox—is instantly inspiring. And now we know his story is too. In order to fully appreciate his present successes—and what are sure to be future achievements — you have to take a look back at where it all started. Preferring an educational route of trial and error, Ed set out to produce his own music, sell independent EPs and book his own gigs—all “without any money or any contacts.” He looked to British musician James Morrison as an inspiration of someone who earned his success one show at a time. “He played loads of shows; that’s how it worked for him,” Ed says. And that’s exactly what he did. 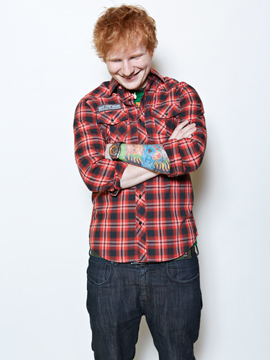 Before his commercial success, Ed released an EP called “No. 5 Collaborations Project” which included his work with some underground UK rappers. Without radio play, television promotion or a label, the EP shot to number two on iTunes. 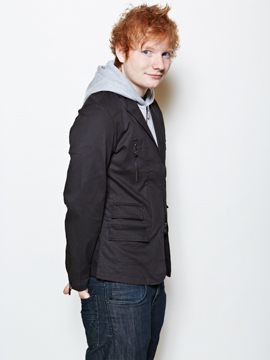 “That was the time where I realized that the fan base was quite extensive,” says Ed. Though he still looks up to other musicians as role models, Ed Sheeran is now a source of inspiration for millions, much like James Morrison was for him. Yet, despite his fame, Ed still remains true to himself: singing his truth through music and living in the moment, appreciating every part of the process. During his show in Toronto, at the beginning of his first headlining tour in Canada, he couldn’t get over the size of the crowd that had gathered to watch him play. He repeated his humble gratitude many times throughout the night to responses of screaming and then complete silence as his fans quieted down to soak up the slower ballads. What I’m doing at the moment. I’m glad it worked out. 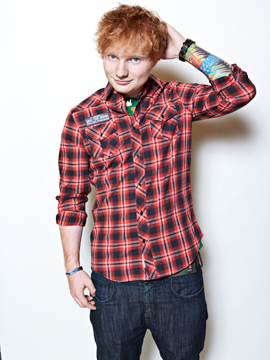 On the cover, Ed is wearing a Projek Raw plaid shirt, $55. 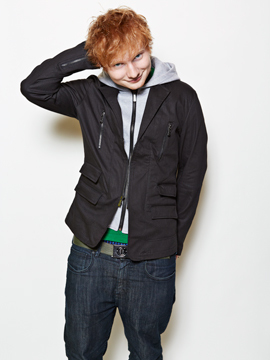 On these pages, Ed is also wearing a Numero blazer/hoodie, $139.